I learned on Saturday, from one of my Willow apprenticeship group, that many Japanese cooks like to peel Sweet Chestnuts when raw and add them to rice whilst it cooks. So today I tried it out and wow – what a sensation this cooking combination can create! I intended to take a huge portion of this risotto into work for tomorrow’s lunch. Umm, there is now only about half a portion left so must think again about lunch. 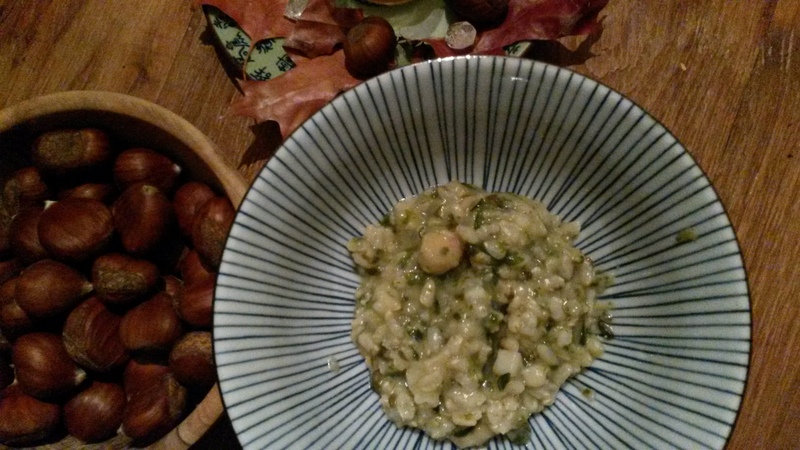 This risotto uses sweet parsnips, sweet chestnuts and rice which is naturally on the sweet side. The other ingredients are savoury and the result is sweet savoury. Never again will I cook sweet chestnuts without thinking of rice first. These sweet chestnuts came to me as a gift – foraged in the east of The Netherlands – unfortunately I have not found them of this quality in Amsterdam, though I’m sure they exist! 6 -8 fresh sweet chestnuts, shell and skin peeled, then the creamy nut broken into rough pieces. Seaweed – I used 1 frond of Dulse or equivalent, finely chopped. 1. Gently fry the onion in a heavy based pan and when translucent add the dry, unwashed risotto rice. 2. Fry the rice in the onion, very gently, for a minute or so. 3. Add 1 cup of boiling hot water. Stir to prevent it sticking to base of pan and simmer steadily with the pan lid on. 4. Continue to stir breifly whenever you think about it. 5. Add the other ingredients to the pan and stir every now and again. 6. Add more hot water, cup at a time whenever you see the rice absorb the cooking water and the dish thickens up considerably. 7. Simmer and add water in this way until the rice is translucent and thoroughly cooked through.